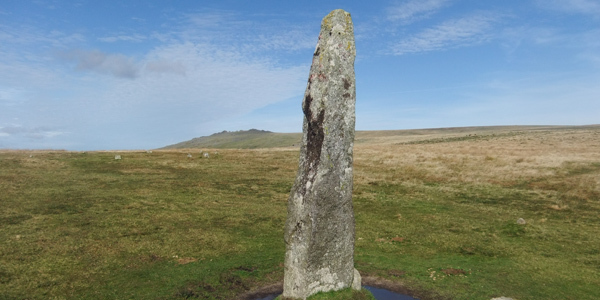 Dartmoor is not without its’ very own supply of impressive Bronze Age standing stones Menhirs. 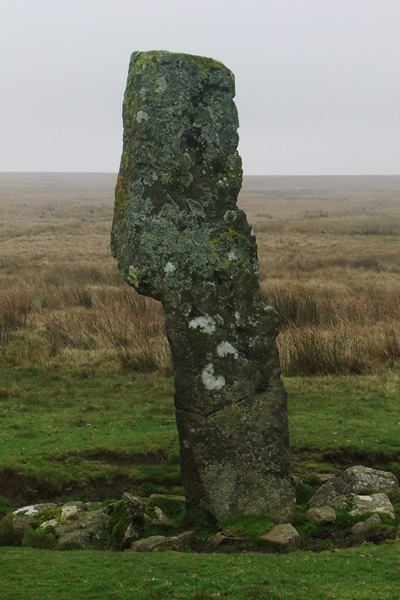 A Menhir is from Brittonic languages: maen or men, “stone” and hir or hîr, “long”. These stones often stand three or four metres in height and weigh several tonnes. As with all bronze age stone structures the stones are natural and unfinished by any stone masons hands. They were obviously carefully selected and no doubt transported some distance before they were mounted. 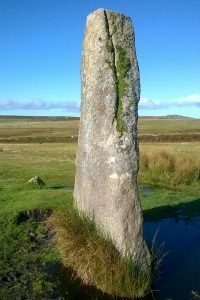 The stones are generally erected into a socket stone or stone cluster under ground, making best use of the length of the long stone above the surface. 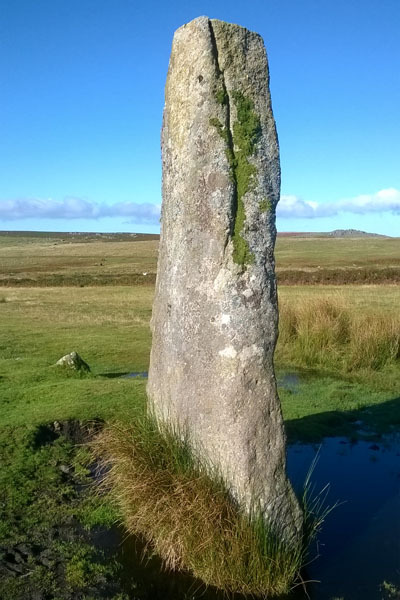 What is extraordinary to consider is that granite rarely splinters into such long slender forms and so a true standing stone, perhaps five metres in length would have had to be located and then transported some distance without damaging it to its final resting place. Sometimes Standing Stones are incorporated into other Bronze Age structures, particularly within Stone Rows. The stone rows at Drizzlecombe are one such example. The stone pictures to the right again stands some 3.5 metres in height and acts as the termination or blocking stone of the lesser stone row at Drizzlecombe. 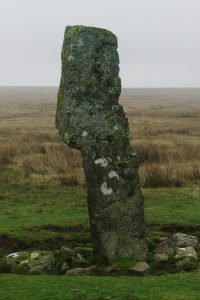 The main stone row at Drizzlecombe also has severallarge menhirs along its course.